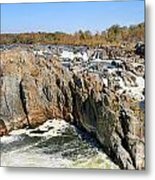 There are no comments for The Great Falls Of The Potomac Panorama. Click here to post the first comment. The Great Falls of the Potomac River are located at the fall line of the Potomac River, 14 miles (23 km) upstream from Washington, D.C. Great Falls Park, operated by the National Park Service, is located on the southern banks in Virginia, while Chesapeake and Ohio Canal parkland is located along the northern banks of the river in Maryland. 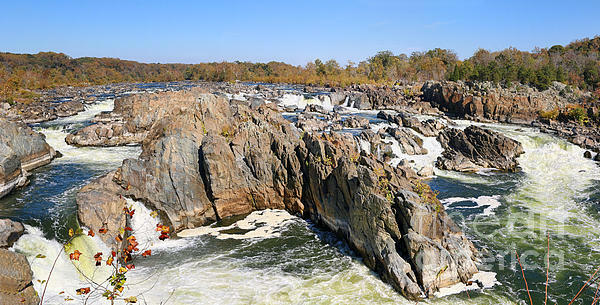 The Potomac and the falls themselves are within Maryland. Scenic views are offered on both the Maryland side and the Virginia side. 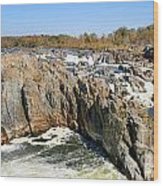 The Billy Goat Trail on Bear Island, accessible from Maryland, offers scenic views of the Great Falls, as do vantage points on Olmsted Island (also accessible from Maryland). There are overlook points on the Virginia side. 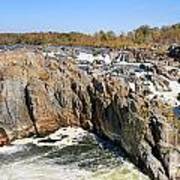 The Great Falls area is popular for outdoor activities such as kayaking, whitewater rafting, rock climbing, and hiking.